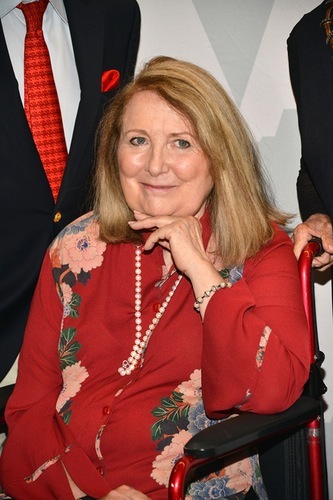 Teri Garr, in the midst of battling multiple sclerosis, remains positive and relies on her family to stay strong. In April, celebrity seekers gathered in LA for The Hollywood Show, a memorabilia and autograph event that featured Oscar-nominated Tootsie star Teri Garr. Though she starred in many beloved films — from Close Encounters of the Third Kind to Young Frankenstein to Mr. Mom — and had a memorable TV role as Phoebe’s mother on Friends, it was a rare public outing for the still-bubbly actress, who has mostly stayed out of the spotlight. There’s a reason Teri, 67, has kept a low profile: Since 1999, she’s been fighting multiple sclerosis (MS), a disease of the central nervous system that’s potentially disabling. Yet Teri greeted fans with warmth at the show, beaming her familiar smile. In an exclusive interview with Closer, Teri insists that her upbeat attitude isn’t an act: “I am happiest when I am around people I like seeing,” she explains. So is Rosa Diaz, who’s worked for Teri since 1994, first as Molly’s nanny and now as Teri’s aide. “I just love Teri,” Rosa tells Closer. “I take care of her and do whatever she needs.” And, Rosa shares that, despite her MS, Teri still loves getting out, walking when she can and using a wheelchair when needed. “Every day, Teri is nonstop!” Rosa marvels. Among her favorite spots to hit are Barnes & Noble (she recently read a biography of her Young Frankenstein co-star Madeline Kahn), and the beach in Malibu. “Teri just loves being outdoors,” Rosa says. Even indoors, she adds, this former dancer remains active: “She works out for about an hour almost every day,” using an exercise bike and other equipment.